Published: Dec. 23, 2018 at 03:43 p.m. 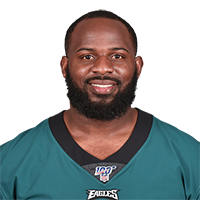 Published: Jan. 21, 2018 at 09:21 p.m.
Philadelphia Eagles defense stop the Minnesota Vikings on fourth-and-2. Published: Dec. 25, 2017 at 10:48 p.m. Published: Oct. 12, 2017 at 10:01 p.m.
Philadelphia Eagles cornerback Rasul Douglas gets his second career interception against the Carolina Panthers Thursday night.